Buzz Lightyear, Jack Sparrow and Mr. 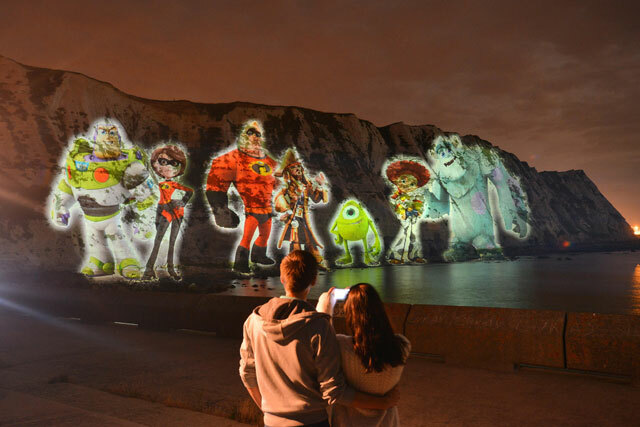 Incredible were among seven Disney characters projected onto the white cliffs of Dover as part of an illumination 80 metres high and 500 metres wide, designed to mark the start of the Digital Disney Parade. The parade saw digitally projected characters turn London into a "city-sized playground" by running across the capital as part of the launch of Disney Infinity, a game that allows players to create their own adventures using Disney characters.